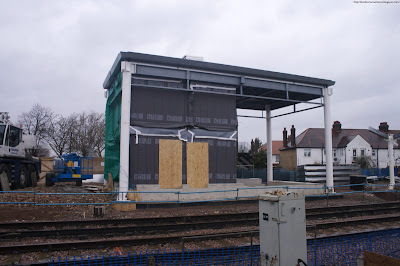 A week ago I tried to call Network Rail's bluff about their prefab station concept. Looks like I've lost. The building should end up looking a lot like the one at Greenhithe for Bluewater, which was built to the same design (turns out Mitcham Eastfields is Network Rail's second modular station). 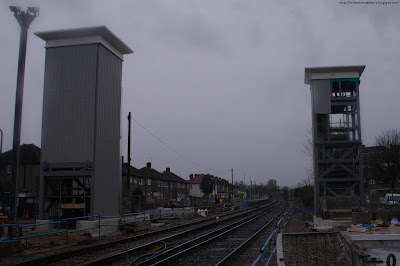 What's the point of a footbridge and lifts when the level crossing is a few meters away? I can only think its for those who can't walk quickly enough to cross the level crossing enough? It's a full barrier crossing, which means the gates close a few minutes before the train is due, and no one can get across. The platforms are positioned to come after the crossing, in both directions. Therefore the gates will always close just as people are arriving to catch a train, stranding people if it weren't for the footbridge. I'm a little confused about the lifts, surely if you are in a hurry stairs would be better? I live the other side of the school and I can see the crossing from my window, I'm personally wondering how long it will take before the lifts are "personalised" by local kids, or possibly worse.
. This is design by accountancy.